The Marvel superheroes have turned against each other (“Didn’t they do that in the first half of Avengers: Assemble?” – Shhh.) And Marvel unveil their vision for Spider-Man (“A kinda crappy costume with a boy’s voice coming out of a man’s body?” – Shhh.) It’s the dramatic new trailer for Captain America: Civil War. Steve Rogers is leading the newly formed team of Avengers in their continued efforts to safeguard humanity. But after another incident involving the Avengers results in collateral damage, political pressure mounts to install a system of accountability, headed by a governing body to oversee and direct the team. The new status quo fractures the Avengers, resulting in two camps—one led by Steve Rogers and his desire for the Avengers to remain free to defend humanity without government interference, and the other following Tony Stark’s surprising decision to support government oversight and accountability. 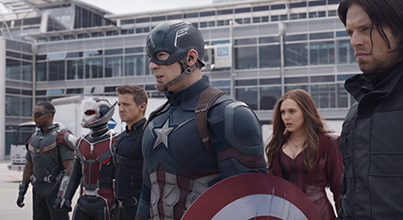 Cap’s team includes Bucky/Winter Soldier, Scarlett Witch, Falcon, Hawkeye, and Ant-Man. On Stark’s side is War Machine, Vision, Black Widow and the newly introduced Black Panther. The new Spider-Man is caught in the middle of it all, but seems to be Stark-leaning according to the trailer. So which side would you choose? Personally I would be cowering behind Vision. Daniel Brühl’s Baron Zemo is the primary out-and-out villain, with Frank Grillo’s Crossbones as the secondary (visible at the 1:56 mark). William Hurt returns as General “Thunderbolt” Ross, now U.S. Secretary of State. Martin Freeman is Everett Ross, a member of the Joint Counter Terrorism Center working to limit superheroes, who’s associated with Black Panther in the comics. The directors of Winter Soldier remain in charge, which’ll bring a more serious tone than Age of Ultrons quippery. It’s looking like it’ll be a much better film. There’s something undeniably intriguing having Iron Man as the antagonist. 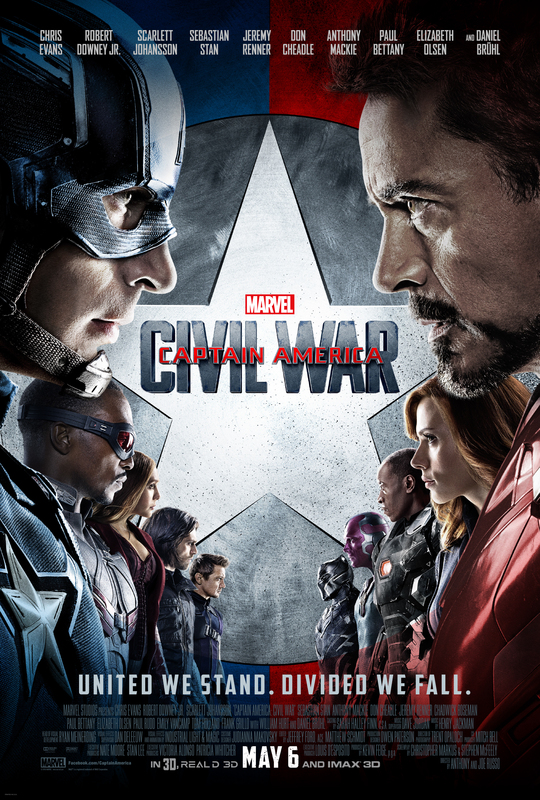 Captain America: Civil War is released in the UK on 29th April and the US on 6th May. The trailer looks good, hope the whole movie is. From the first Cap 2 movies this one should be, but MARVEL never made a “bad” movie in my opinion.